The thought of it fills me with a warm and fuzzy glow, which makes it rather hard to think of what to say about it. It’s something pervasive and intangible, part of the atmosphere of life, but hard to home in on in concrete terms. Maybe it’s a little bit like the music that plays in our MMOs, something that provides a background that shapes and enriches our experience without our always being aware of its presence or importance. I certainly wasn’t expecting to find any of that when I first started playing MMOs a little over three years ago. I was a latecomer to MMOs for various reasons. For one thing, I wasn’t all that keen on paying recurring subscriptions; for another I’d heard the stories about people getting hooked on World of Warcraft and I could well imagine that could happen to me. But another reason, and the most relevant to the topic of community, is that I didn’t know anyone who played an MMO. Now that certainly seemed like a barrier to playing and enjoying a genre which as far as I knew required a lot of cooperative play over a period of months or years. In time I gathered that MMOs were becoming more solo-friendly, and when I discovered that LOTRO had become free-to-play, being a big Tolkien fan I felt the time had come to go take a look. When I started I wasn’t expecting to group much at all, nor to join a guild, let alone discover a community. I remember researching which classes were the most solo-friendly, and that if anything I avoided the busiest servers. It wasn’t that I had anything against grouping, I just assumed everyone was playing with their friends, and there’d be no particular place for me in their circles. I did have my first taste of the LOTRO community though, even before I ever grouped. That was via Googling for information and coming across the wonderful, now shuttered, mmorsel for Lord of the Rings Online and Lotro-Wiki, which is thankfully still going strong! I got a sense that there were people out there who loved the game, enjoyed pondering it, and liked sharing their know-how. This was still a “read-only” experience however, I didn’t imagine even the possibility of interacting with these folks any more than I would imagine interacting with someone I saw on TV. I can’t remember how I first found myself in a fellowship. Did someone invite me to group? Did I take the initiative? I don’t know any more, but I wasn’t long in LOTRO before I had a lot of fun playing in ad hoc duos with people who were going through the same areas as me. It probably helped that there were a number of designated group quests included in the Epic storyline, which naturally led people to find others if they could. And of course, completely contrary to my expectations, I got a lot of random invites to join kinships. Since I was enjoying grouping when I could, it seemed a good idea to give one of these a try. Unfortunately my first kinship experience was not such a good one. The person that recruited me was nice enough, and so were many of the other members. But it was hard to really connect with an in-group who already knew each other so well, and on top of that there were a few members that were pretty childish and at times obnoxious. (Turned out that one actually was a teenager, so perhaps the childishness was understandable.) So after a short while I dropped out of that kin, and went back to my soloing and ad hoc grouping. Eventually I lucked out. After ignoring lots more invites to kinships, one day I did respond to one. Maybe it was worded in a way I liked, I don’t know why I actually started chatting that time instead of ignoring it like all the other random invites. It was an enormous stroke of luck! I became part of a wonderful small kinship, hit it off with the others, and never looked back. There’s not a lot more to say about that. Though I met them in-game, this is how I imagined people played MMOs, with a small group of good friends, enjoying the company and the laughs as much as the game itself. Eventually I did have characters on other servers and in other – larger – kinships as well. Maybe I got better at picking which to join because I only ever had that one not-so-great experience in a kinship, and even that was not really so bad either. To anyone that is hesitant about guilds and kinships, my advice is go try, and if at first you don’t succeed, don’t worry. Go try a few until you find one you love – it really makes a game. For a long time, “community” would have meant mostly my in-game community to me, my friends, my kinnies, the people I ran into in PUGs and so on. I did gradually become aware of a few blogs, especially when I went looking for information about various parts of the game. It was probably Pineleaf’s Skirmish Guides that first led me to Casual Stroll to Mordor (CSTM). CSTM became the hub of the out-of-game LOTRO community for me. At first I’d visit to get info on the game, later I dropped by every day, and soon it became the place to discuss the game. It’s hard to pay proper tribute to CSTM in the space I have here. Without it, I wonder if there even would be a true LOTRO community? Certainly any community that arose would have been very different than it was. Merric and Goldenstar were the couple who started the site and hosted the podcast. I’ve referred to them before as the Angelina Jolie and Brad Pitt of the LOTRO world, such is their superstardom! They helped bring the community into being not only through their own posts and podcasts but by providing a welcoming venue for others such as Pineleaf to get started. That created a critical mass so that there was plenty for everyone to talk about, and a lively and friendly place to hang out and discuss the game. As with all things, time moves on, Merric and Goldenstar’s priorities changed and the CSTM site is no more. However because of the kick start it gave the community, its influence lives on. 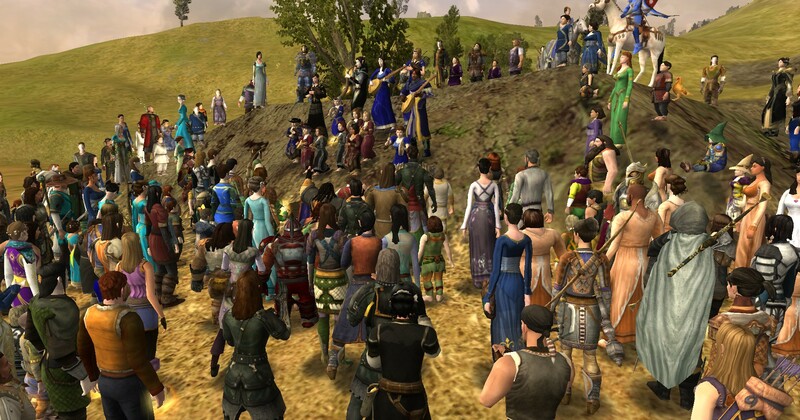 Many of the contributors to CSTM went on to create LOTRO Players, which now has a similarly important role as CSTM formerly did. Perhaps this is the key thing about community: It has a life beyond that of any individual. We can all contribute in ways large and small, and our contributions become part of the evolving stream of community life. Some like Merric and Goldenstar make a huge and long-lasting contribution, so even after they’ve moved on we remember and salute them. I daresay it is one of the most satisfying and enduring accomplishments that a person can have. Which brings us to another esteemed community member who has done much for us all, and is about to reduce his own participation. Roger has not only created a thoroughly enjoyable podcast and blog, he has directly helped many of us get started in our own efforts. Without the Newbie Blogger Initiative of 2013, this blog would not exist, and nor would I be participating in Twitter today. Therefore without Roger’s drive and commitment to make the NBI 2013 and 2014 happen I wouldn’t have the delightful community that I have today, which is not only the people that I play with directly, but even more so the people I’m connected with via blogs, podcasts, Twitter, WordPress.com, and other networks, many of whom don’t even play the same games as I do. This community is, as I said earlier, a little like the music playing in the background of our MMOs. Without it maybe life would go on much as it is, and would be pretty enjoyable regardless. Nonetheless its constant presence adds an extra layer of richness, enjoyment and sheer fun that would otherwise be lacking. So many many thanks to Roger, to Merric and Goldenstar, and to all those who’ve helped create our community, to make it what it is today, and make it welcoming to all. Thanks also to everyone who participates in the community in ways large and small. I couldn’t have foreseen any of this when I first decided to give LOTRO a try. My experience in the world of MMOs has truly been of a series of wonderful, delightful, and completely unexpected parties! This entry was posted in LOTRO, Misc and tagged blogging, community, friendship, mmo. Bookmark the permalink. I think I had similar feelings to you before starting my first MMORPG (about the subscription and knowing I’d become addicted,) but I’d also just never really seen a reason to start. I think for many people it takes knowing somebody else to introduce them into the genre. I met a few people who recommended some games and encouraged me to start. I instantly loved it and had no reservations about connecting with others through them. It was later that I became more reserved. LOTR sounds like it has a great community behind it. I’ve only played a little bit of it myself, but I keep intending to put more time into it. I’ve been considering it recently. I’m sort of between games and deciding what I fancy. Knowing someone else I’m sure makes it a whole lot easier to get into a game, esp MMOs. Which of course places some limitations on how easily it can take off! If you decide to get more into LOTRO, feel free to ask me for any tips, like choosing servers, classes etc. It’s a good game, though the cap is a very long way from the beginning now!